IN EARLY August, Magodh Dhungri, a fishing village on the southern Gujarat coast was invaded by a smell very different from that of drying fish. When the fishermen came out to investigate, they saw lumps of tar-like substance floating on the sea surface; the coast was littered with them. “We see this happen every year but this year, it has been very bad. The waste has affected more than 100 km of coastline, we may not be able to fish,” said Ramubhai Kandil, sarpanch of the village. Ramubhai informed the Brackish Water Research Centre (BWRC), a nonprofit working with fishers. “The state pollution control office at Vapi in southern Gujarat tested the tar samples and found the balls contained grease and 500 gm oil in every kilogram of waste which proves it is crude oil waste,” said M S H Sheikh of the nonprofit. Bombay High, India’s largest offshore oilfield, could be the source as it usually dumps its waste in the sea, he said. The coast guard has been conducting aerial surveys to identify the source but has been unsuccessful, he said. The entire coast from Vasai in Maharashtra to Vasi Borsi near Surat is affected, said Ramubhai. 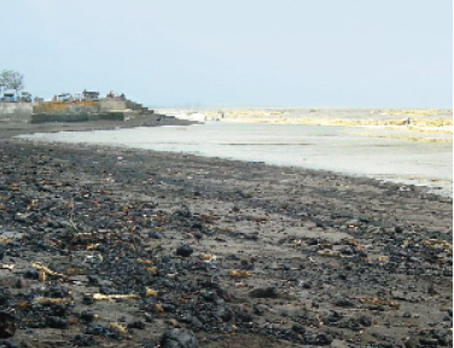 “The pollutants would affect over 100 fishing villages on this side of the coast,” he added. The state’s Department of Environment sent a team to collect samples of the waste that have been sent to the Indian Institute of Petroleum in Dehradun for analysis. “Prima-facie this seems to be crude oil but we cannot say so conclusively until we see the reports. The clean-up operations have been started by the Daman Pollution Control Committee and Gujarat pollution control board,” said Hardik Shah, technical officer in the environment department. But villagers claim no clean-up has been initiated. “We have appealed to the district collector to get the coast cleaned up fast so we can resume with our fishing activities. The officials said they will ask the company responsible to clean it up,” said Ramubhai.